21-year old Daronique Young will represent the Bahamas at the Miss World 2012 competition in Ordos, Inner Mongolia, China, in August. The 173 cm beauty is also a student of tourism management. April 15, 2012 – It’s a summer affair for young ladies who dream of becoming Miss Bahamas, and this year they will have to win over a judge who has already conquered the Universe. Miss Universe Leila Lopes will be among an impressive panel of judges who will choose the country’s newest beauty ambassadors during the official preliminary pageant to Miss Universe and Miss World, scheduled for Sunday July 29th at Atlantis, Paradise Island. The organization is hoping that it will have a minimum of 20 competitors this year. “Our past and present queens have done well for themselves, receiving worldwide recognition for their efforts. 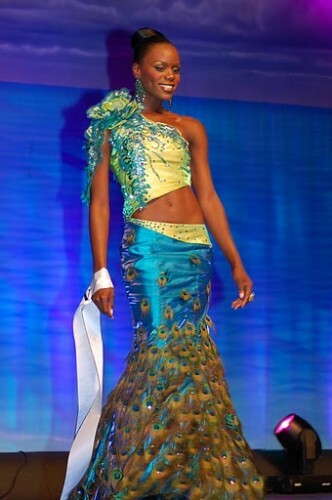 However, for each of them it all began by filling out an application form, which can be found at www.missbahamas.net. It’s the first step to what can be an incredible journey for two lucky young women,” stated Miss Malcolm. Anastagia Pierre is the reigning Miss Universe Bahamas, while Sasha Joyce wears the title of Miss World Bahamas. A screening is scheduled for May 19th (venue to be announced), at which time applicants will be interviewed one-on-one by MBO officials. Applicants will need to bring along a Bahamian passport, birth certificate, a valid police record, a pair of high heels and a swimsuit of their choice. A non-refundable application fee of $100 will also be due payable. Naturally born females between the ages of 17 and 25 who are of Bahamian ancestry and/or citizens of The Bahamas may enter the Miss Bahamas Beauty Pageant. Contestants must be at least 17 years old by Coronation Night. However, all women crowned queen must be at least 18 years old and under 24 by February 1st in the year that follows their coronation. Candidates must be single, must not have children, nor have ever been pregnant or given birth. Minimum height requirement is 5′ 3″ and maximum height requirement is 6′ 2″. Weight must be proportionate to height. Candidates must be beautiful in face and figure, intelligent, and charming, while possessing poise, a pleasing character, and high moral convictions. The Miss Bahamas Organization reserves the right to refuse an application or dismiss a contestant, using the Organization’s codes and regulations as the basis for its decision. Meanwhile Daronique Young – who placed first runner up to Sasha Joyce in last year’s competition – will represent the Bahamas at this year’s Miss World pageant. Several factors led to this development, including changes in the dates of both the Miss World and Miss Universe pageants, and the pending general elections here in The Bahamas. Miss World, which is normally held in November/December, was moved to August of this year, while Miss Universe – normally held in August – was moved to December. Daronique leaves for the pageant on July 17th. An unveiling of her wardrobe will be held closer to her departure date. * Courtesy of Global Beauties.